The prices listed below assume that you have reviewed the descriptions and options. Since we started offering the Tilt-Up Rails, EVERYONE has chosen that option, so we are offering that $450 option FREE this month. In fact, most customers order all the options, so we have arranged the price list with the upgrade options combined for your reference. Without this month's discounts, the total cost would be $3760. But with the discounts, it is $2495 and we also pay a portion of the shipping cost! Shipping Information - $50 to $100 Shipping Discounts if ordered in April! 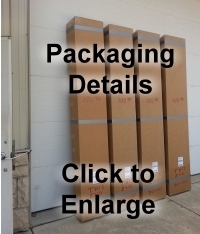 The packaging of our standard 8-Foot Rails is 104x18x10 inches and 100 pounds. Shipping is usually $200 to $250 depending on your location within the Continental USA. But if you order in April we will ship for $150 and we will cover the difference. Note: It cannot be shipped to a residentially-zoned address because it exceeds the 70-pound residential limit. So you will need to provide a commercially-zoned address. Many customers have us ship directly to their marina. If you are outside the Continental USA, we can get an exact shipping quote when you confirm the quantity you want. If you are ordering the 12-Foot Rails, please inquire about the shipping cost when you click the email link below. They require overland trucking. 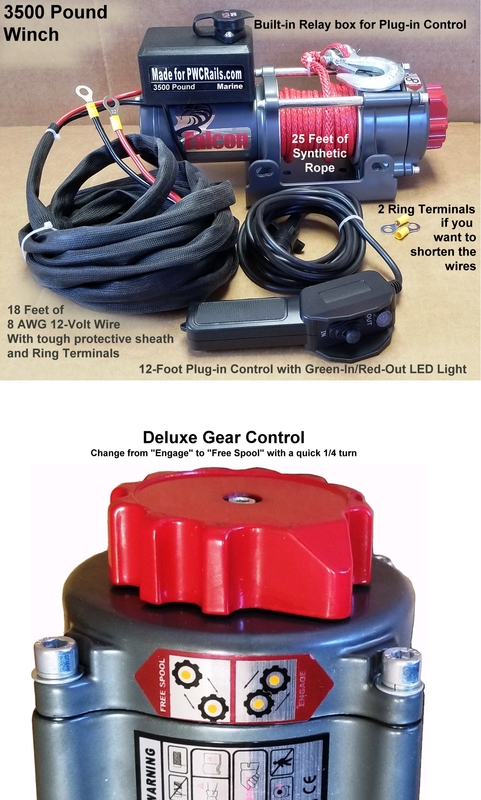 With the $450 Tilt-Up Option FREE this month, the $275 Deluxe Features, plus the $320 Marine Grade Winch FREE this month, the $20 Synthetic Tether FREE this month, the $200 powder coating discount, and the $50 to $100 shipping savings, that is over $1300 of discounts if you place your order before the end of April. As with all our product lines, we guarantee your satisfaction. If the PWC Rails don't meet your satisfaction, you may return them within 90 days for a full product refund (not including the shipping cost which will be deducted from the refund). When we have answered all your questions, please print and email or fax the Order Form to us. We will create an invoice from that information and send it right back to you. We invite you to send us an email letting us know the following information. We will reply with our feedback and recommendations. Click here to open an email with these questions on your computer. 1) Who is the manufacturer of your houseboat? 2) What is its width and length? 3) Where is it located (body of water and state)? 4) What size is your PWC(s)? For instance, "a 3-seater Seadoo". 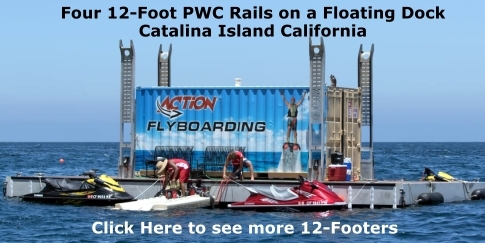 5) How many PWC Rails are you considering? 6) Are you just gathering information at this time, or are you wanting to get some Rails right away? 7) What is the approximate front-to-back depth of your swim platform? 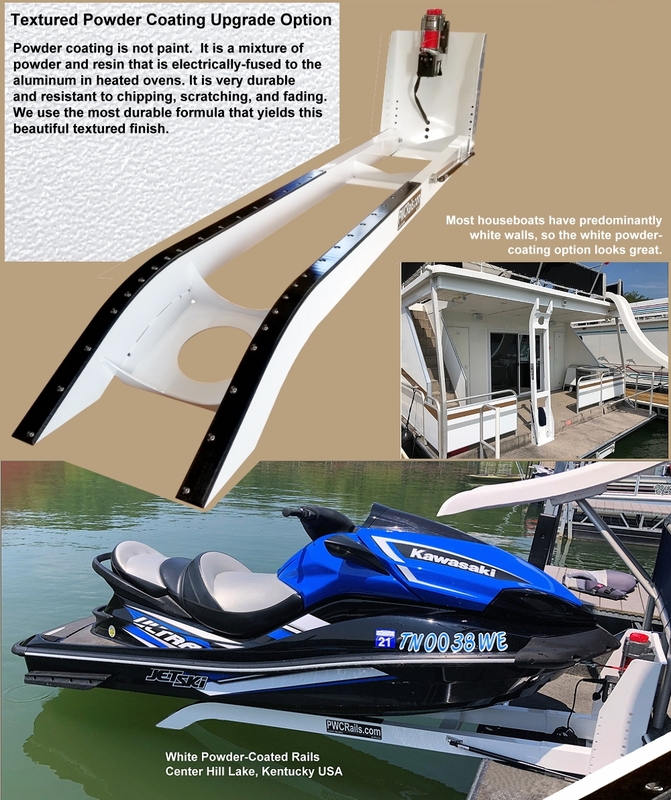 8) If not mounting on a boat with a swim platform, is it a dock, pontoon boat, or other application? If you have any pictures of your houseboat, especially the rear, feel free to include those. If you have any questions before ordering your Winch-Up Rails, please call me at a 1-937-985-5863 (Eastern USA) or click the above link to send an email with as much of the above information as possible. We will reply quickly. We take great pride in fast communication and service.